Tarps Plus Blog: Get Your Ripstop Tarp! Are you tired of having to replace your tarp constantly? or you just simply want a real heavy duty tarp that will really last? If so then I have good news for you. Many do not know that Ripstop Tarps do exist. They are perfectly designed to help stop ripping once a small tear has occurred. 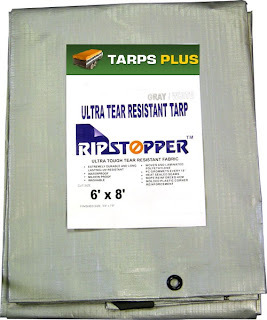 Ripstop tarps are the best in tarps making your money go real far. All poly tarps come with great features such as water resistant, mildew resistant, and many other features that make these tarps a very attractive purchase. Ripstop tarps are not sold everywhere but www.Tarpsplus.com has a very good hold of these in many different sizes. If you use tarps as fence covers these ripstop tarps work excellent as the wind and weather can easily tear down most tarps but these ripstop tarps will work great. Check out the selection of these ripstop tarps on www.Tarpsplus.com all tarps are currently on sale. Yep, I will only use these rip stop tarps. They work great and last 4ever. These are some great tarps I tell ya. I received my tarps today, they seem pretty heavy duty.